Joanne Kaminski is a Reading Specialist that volunteers her time in classrooms around the world reading books and motivating children to read. She is also an online Reading Tutor that uses Skype to increase students reading levels from the comfort of their h ome. Check out her Reading Tutor website. Joanne currently lives in Sussex, WI with her husband, three daughters, and her amazing new puppy. Her favorite place in the world is the library and she spends a considerable amount of time there each week picking out just the right books for kids. Joanne also loves to crochet, make jewelry, and sew. All of course, when she is not busy reading. Hi, I saw you on twitter and went to your site. 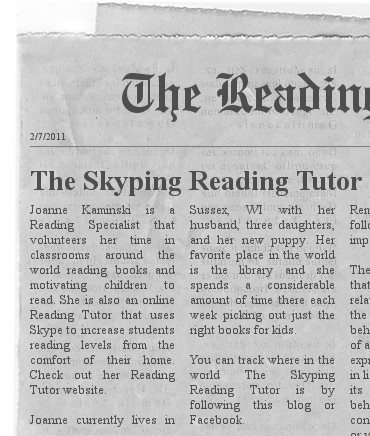 What a great idea to be a Skype reading tutor! I would like to feature you and what you do on my blog for parents and teachers on “Can Do” Street. My site, http://www.candostreet.com is an animated interactive site where children 3-7 years can learn about and practice making good choices. 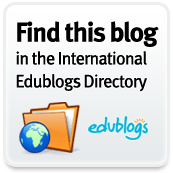 In addition to the programs, games, lesson plans and resources for parents and teachers, there are two blogs, one for parents and teachers and one for children. If you are interested, after reviewing my site, I can feature you and your blog as a guest post including your URL address. Featured guest content can be done two ways: You can submit your own content or I can lift content from your site … content is usually about 500 words. post. I hope you will be interested. i know my readers will be very interested in what you do. What Joanne is doing in many respects is similar to http://www.kahn.org. Joanne targets reading and vocabulary, Kahn targets math. Clearly with the proper resources and a little help I am absolutely persuaded that http://www.theskypingreadingtutor.com would complement kahan.org. Joanne, I’m very interested in your skyping tutoring because I have a project in mind when I retire from education in a few months. This idea is still rolling around in my head. I would like to skype with students that are turn off to school. This would be a buddy type program where I would hopefully connect and built a relationship. The goal would be to turn kids on the fun and excitment of learning. I may be looking to you in the future. My hat is off to you and your efforts with reading. What a fantastic idea. It is amazing how easy it is to turn kids onto education and you have a great goal in mind. We are so lucky that we have amazing educators that even after they retire, they still want to make an impact on kids lives. Way to go. Let me know how I can help when you are ready to move forward with that idea.